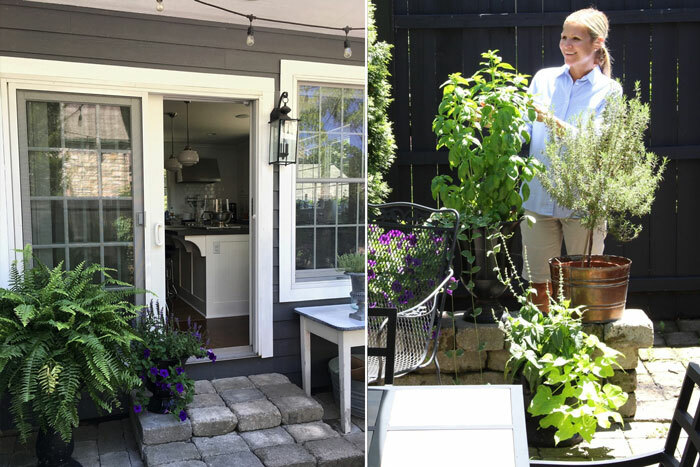 Today's beautiful backyard comes from House 214 Design - I first discovered her beautiful home on instagram and then turned to her blog to see more. She has amazing style so I wanted to know what her outdoor space looked like too! As you can see, she has a green thumb (something this black thumb envies hard!) and has a great point on making the outdoors work with your indoors. I love the time of year when the cooler days slowly turn into ones filled with open windows and dinners outside on the patio. The outside becomes another place to live and another place to feel home. We have a busy household with three children. The last thing I want to create in our home is unnecessary chaos. I choose design elements that are consistent both inside and outside our home to create a calming and predictable setting. When I stay consistent with these elements, my home doesn’t feel disjointed when moving from room to room or inside to outside. It actually creates the opposite outcome and everything flows and connects. Well isn't that smart? I honestly never even think about my indoor style matching my outdoor style but it makes so much sense from a serenity point of view. Thanks for the tip Melinda! Want to see and hear much more? Head over to House 214 Design for the full tour. Stop by tomorrow for some porch inspiration!